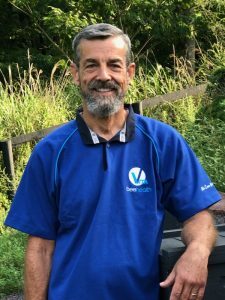 Jerry Hayes, distinguished international honey bee expert, has been appointed vice president of Vita Bee Health North America and will give a free public talk in the home town of Vita Bee Health: Basingstoke College of Technology, Basingstoke, Hampshire, England. In 2006 when Jerry Hayes was the chief of the apiary section of the Florida Department of Agriculture, he received several calls from a commercial beekeeper saying his bees were gone — not dead on the ground or dead on the bottom board they were just gone. At the time, with 14 apiary inspectors and regulatory and health oversight for 350,000 colonies, the call didn’t seem that out of the ordinary to Jerry. He received lots of calls from beekeepers that their bees had died for one reason or another. So, this was just another one. But the commercial beekeeper kept calling him, so Jerry went to visit. The beekeeper’s description was absolutely right. The bees were gone, not dead in or around the colonies, just gone! Jerry arranged a major conference call with Florida state agricultural and academic colleagues to share recent experiences with beekeepers, to explain what they had seen and to try to uncover the cause. No one had any idea what it was but they decided to call it Colony Collapse Disorder — CCD. A ‘disorder’ as there was no identification of the cause. Because it was named a disorder, they had all been in the beekeeping industry long enough to know that it would disappear in a few months, be ignored and nobody would pay much attention. Honey bee health was always ignored. History was to prove different. In 2018 we know a lot more about honey bee health and this thing called CCD. Bee Gym : De nouveaux résultats positifs !